Switzerland relies heavily on exports, which account for 70% of the country’s GDP. The country expected increased demand from the eurozone in H2 of 2016. However, the uncertainty in the 2017 outlook of some of Switzerland’s main trading partners may prove impact payment behaviour. Respondents in Switzerland (28%) do not sell on credit terms as much as their peers in Western Europe (39%). 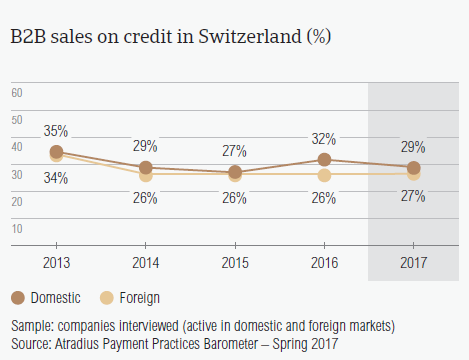 Moreover, in 2017, credit sales by Swiss respondents seem to have decreased compared to 2016 (28.8%). On average, 29.3% of the sales to domestic B2B customers were made on credit. Only 26.7% of respondents’ sales to foreign B2B customers were on credit. Similar to what was observed in 2016, the percentages of sales made by Swiss respondents on credit terms are significantly below the regional averages (domestic: 42.6%; foreign: 35.1%). As observed in previous surveys, respondents in Switzerland used a similar approach to granting trade credit to that of respondents in Austria and Germany. This may be a reflection of similarities in these countries’ business cultures. Among the Western European countries surveyed, respondents in Switzerland reported late payments most frequently. The proportion of overdue invoices also increased slightly compared to 2016. 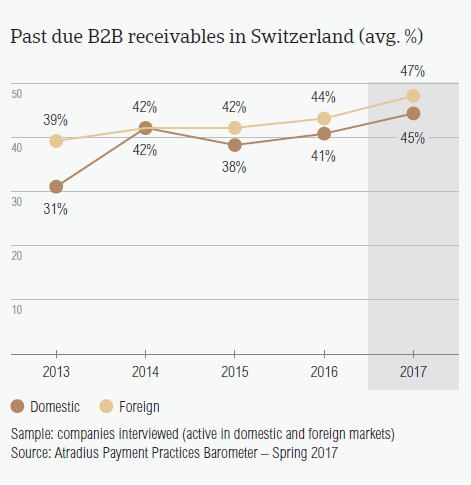 The percentage of respondents in in Switzerland who reported late payments from their B2B customers rose to 95.4% this year from 90.5% in 2016. This was the highest percentage in Western Europe where the average was (87.8%). 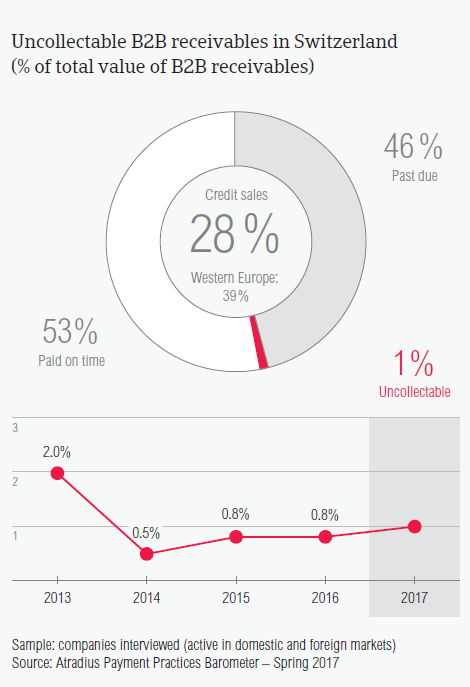 An average of 46.2% of the total value of B2B receivables remained unpaid by the due date. The percentage of overdue invoices in Switzerland is higher than one year ago (42.6%) and the 41% regional average. Late payment of domestic and foreign invoices is reflected in the Days Sales Outstanding (DSO) figure reported by respondents in Switzerland. In 2017, this averaged 36 days (eight days shorter than in 2016), and is less than the 44 days average for Western Europe. The lower average DSO level may point to Swiss respondents’ higher efficiency in collecting high value invoices. 59% of respondents in Switzerland (62.9% in Western Europe) expect no change in their annual average DSO over the next 12 months while a sizeable 20.7% expect an increase (19.1% in Western Europe). 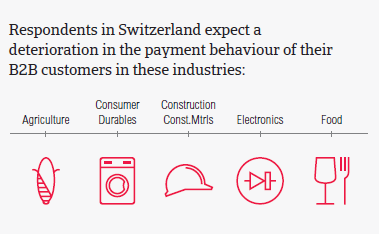 Respondents in Switzerland offer some of the shortest average payment terms in the region. The short payment terms emphasize swift invoice payment and further demonstrate the lower level of comfort with extending credit than in other Western European countries. In 2017, payment terms granted by respondents in Switzerland averaged 28 days, one day longer than the average of 2016 and below the regional average of 32 days. 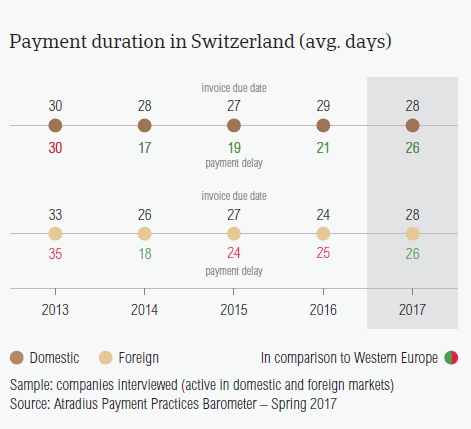 Despite the somewhat longer payment terms granted by respondents in Switzerland, they still remain some of the shortest in the region. Once more this underlines the lower level of comfort that Swiss respondents have with extending credit compared to other Western European countries surveyed. Consistently with what was observed at regional level, there was a modest increase in payment delays from domestic B2B customers (up five days compared to 2016). Foreign B2B customers also pay, on average, one day slower than in 2016. Respondents in Switzerland need to wait 54 days (four days longer than in 2016) to convert B2B credit sales into cash. More respondents in Switzerland than in Western Europe reported liquidity issues as the main reason for payment delay by domestic and foreign B2B customers. 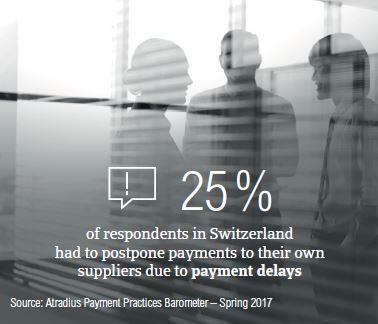 56.1% of suppliers in Switzerland (52.6% in Western Europe) said that their domestic B2B customers delayed payment most often due to liquidity issues. Buyers using outstanding invoices as a form of financing (21.3%) and the complexity of the payment procedure (20.7%) were seen as the second and third main reasons for payment delays. In respect to overseas customers, 40.5% of suppliers in Switzerland (34.5% at regional level), said the key payment delay factor affecting credit based transactions with overseas customers was insufficient availability of funds. As observed with domestic customers, this was followed by the complexity of the payment procedure (33.6%). Payment delays by domestic and foreign B2B customers appear to have caused 17.6% of respondents in Switzerland to lose revenue. This percentage is slightly higher than that in Western Europe overall (15.3%). As a result of late payment, 25.1% of respondents in Switzerland said they needed to take specific measures to correct cash flow. This compares to a lower percentage of 19.8% at regional level. 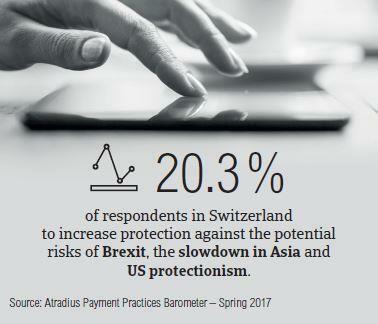 20.3% of respondents in Switzerland reported that they will increase their use of credit management techniques to protect themselves against the potential impact of Brexit, the slowdown in Asia and of US protectionism. Similar to what was observed at regional level (48.3%), the majority of respondents in Switzerland (38.5%) said that they will maintain their current use of credit management tools to protect their businesses from risks stemming from the above mentioned developments. 20.3% of respondents in Switzerland (more than the 18% registered at regional level) said they will increase protection mostly by checking their buyers’ creditworthiness (29.3%) and by monitoring buyers’ credit risk (23.3%). The actions chosen by Swiss respondents to increase protection against the impact of Brexit are: checking buyers’ creditworthiness (30.4%), monitoring buyers’ credit risk (21.1%) and increasing bad debt reserves (21%). While the slowdown in Asia doesn’t prompt as many respondents to increase protection, 25.7% said that they will check their buyers’ creditworthiness more often and 22.6% said they will monitor buyers’ credit risk. To manage risks stemming from US protectionism, respondents in Switzerland said they will increase their frequency of checking buyers’ creditworthiness: 31.8%; and monitoring buyers’ credit risk: 26.4%. 0.5% of the total value of B2B receivables of respondents in Switzerland was written off as uncollectable (. This is slightly less than the 0.6% regional average. Domestic receivables were written off as uncollectable more often than foreign receivables (% of value of: domestic 0.8%, foreign 0.2%). Still, the percentage of uncollectable receivables was below the regional averages (% of value of: domestic 1, foreign 0.3). B2B receivables were reported to be uncollectable mainly because the customer went bankrupt (60%), the inability to locate the customer (25.7%) and because of the high costs of pursuing debtors (24.2%). More than 30% of respondents in Switzerland expect deterioration in the payment behaviour of their B2B customers over the next 12 months. Invoice payment terms given to B2B customers in the paper (40 days), chemicals (39 days), metals (36 days) and construction industry (31 days) are longer. This means B2B customers in these sectors had up to 12 days extra to pay their invoices compared to the average payment terms at country level. Industries which were extended payment terms under the country average were financial services (22 days), textiles (23 days) and business services (24 days). Despite the longer payment terms given, customers in the metals and construction sectors took the longest to pay their invoices (62 days and 54 days respectively). The most frequently cited reasons for payment delays were buyers’ use of outstanding invoices as a form of financing (metals: 58%; construction: 34%) and insufficient availability of funds (metals: 50%; construction: 43%). More respondents in Switzerland (34%) than in Western Europe (26%) expect deterioration in the payment behaviour of their B2B customers in the coming 12 months. Swiss business insolvencies increased 7% in 2015 due to a more difficult economic environment. The number of corporate insolvencies remains high in 2016.